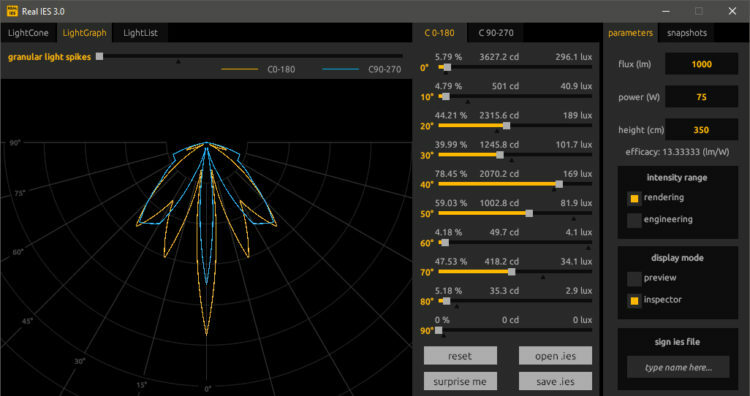 PlaySys Software Engineering has released Real IES 3 – a new major update of standalone software-agnostic utility for generating photometric .ies files for 3D rendering and CGI. We have asked the developer of this software, Luca Deriu, to present this release and tell us more about the new features and what to expect in the future. Let’s start with the core: what’s new in Real IES 3? Real IES 3 has so many new features that will take some time to list. Although, for this release, I was focused mainly on portability, usability, and reliability. I mean literal portability of the software from one machine to another. This can happen thanks to my new licensing system – used also in other software such as Real HDR and Render Academy Classroom beta. In the previous releases of Real IES, the software was generating a unique code based on the machine serials and user ID. The customer had then to send the code to Real IES php program that would generate an activation key to be used in pair. It was fine but it was the classical private and public activation key system while now we have an online encrypted auth code. What changes for the users is that there are no longer dependencies on the machine where Real IES has been activated and the license can be moved once per server’s calendar day. About usability, the main change has been made on the user interface. Now the user has powerful tools reachable with less than a click (yes, I mean, even on mouse-over). 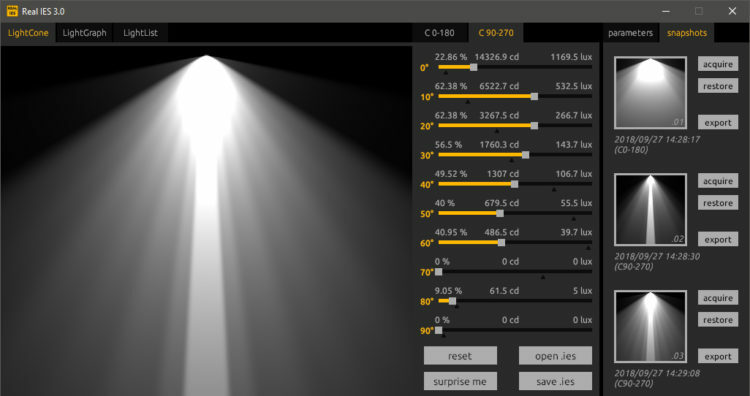 Real IES 3 has more consistency in the layout and colors so even if, after all, the software is quite simple, the UI is able to simplify the full experience of creating photometric light profiles. To achieve this redesign I collected a lot of useful data from our customers and from my students. Having more than 20 hours of CGI classes per week and supportive customers from all around the world, helped me to test Real IES on other people experiences and not just mine. Reliability is about the math behind the scene. I had to rewrite the code since I had the idea of new features. The previous code, in fact, required some cleanup and extensions to compute new useful values and get rid of excessive interpolations. Some formulae have also been rewritten with new solvers and the data management is now more direct to the goal. This made the asymmetrical lights and the light rays possible. The file input/output system had to be expanded having now more angle data and fewer interpolations between them. 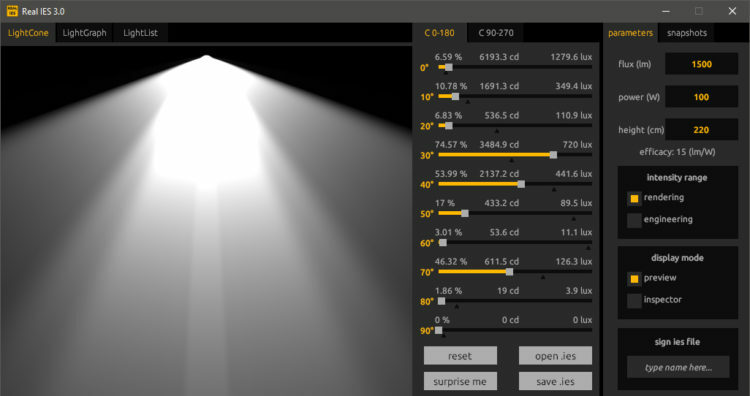 The main feature you will find for this are the LightGraph and the non-symmetrical light support. Can the users of Real IES 2 benefit this new update? Sure thing, even the users of Real IES 1! Everybody who trusted in me, buying Real IES since the first days deserves my gratitude and has already received one or more activations key according to their purchases even if the price has been raised a little with this new release. I want to use this occasion to say once again “thank you” and tell your readers a short story about this idea of one-time purchase, hoping this may be of some inspiration. There was a young guy many years ago that was passionate about music and had the dream of becoming, within the various professions, a rock star, and music producer. He had diverging musical interests in death-metal, Eurodance and classical-experimental. He was a drummer but was also composing digital music with two software: BuzzMachines and Fruity Loops. This guy was born and grew up in a small town where people had expectations from brands and big-names more than results and actual quality. In that town, people are still judged nowadays on their clothes more than their thoughts and interests. This was for that young man a reason of sad feeling since Fruity Loops – the software he was using and loving – was not considered The Tool as Cubase or others. But the guy remained loyal to his software, producing his songs with passion and fun. Time passed and Fruity Loops become FL Studio, one of the biggest and most popular software used nowadays to produce music. Where is the point? The point is that I am still having free updates of FL Studio since I bought the first release of 29$ (or something like that). How FL Studio team kept their promise to me, a drop in the ocean inspired me and I want to give the same example to my customers. Two years have passed since the release of Real IES 2. Why did it take you so long to put Real IES 3 on the market? There are two main reasons for this, besides me being lazy. The first reason is that, as said before, with Real IES 2 I encountered some technical limitations that made me think if I really have met the final stage of the software. It was not wrong, it was simply finished and the development was over. 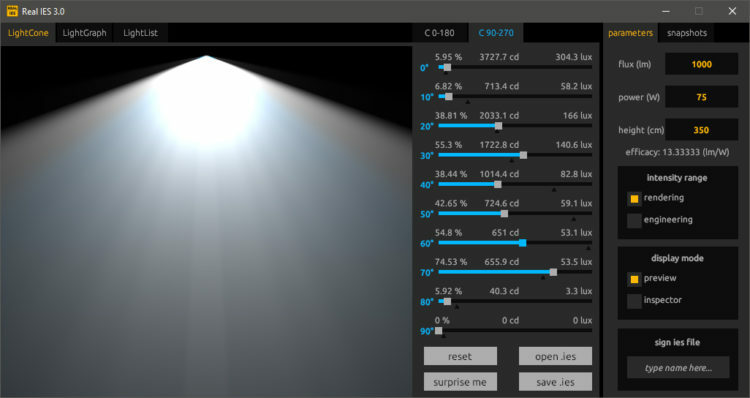 If a person needed a photometric .ies light profile, Real IES 2 was the proper tool to obtain that. Stop. The second reason is that I am working on different software, video games, music albums at the same time. I also spend a lot of time in schools since I am lecturing on these topics so, simply put, it was the lack of time. How did you get the idea for this software in the first place? That happened so long ago, much before the first version of Real IES and sincerely I have no idea of the year. For sure it was after 1998 though, the year when I started doing 3D with Kinetix’s 3D Studio Max. I have always had this passion for software programming. 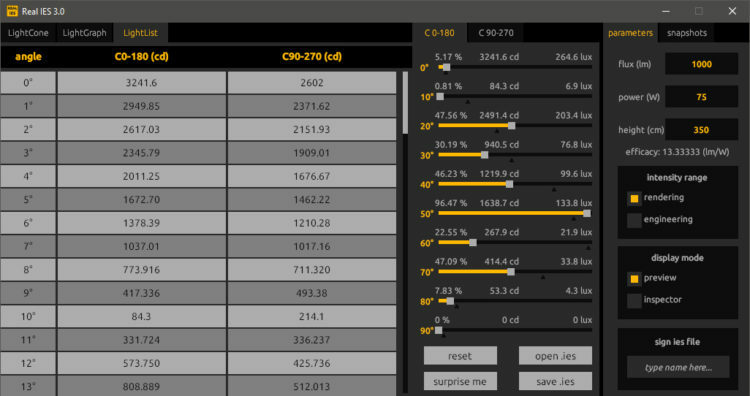 I coded my quotation software, my invoicing system, and when I was in high-school I coded a suite for computing the CNC lathe’s cutting speed for different types of metals. 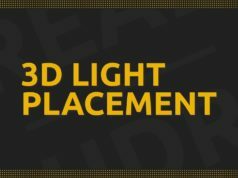 So, there was a time when I was doing renders for customers and I was feeling the necessity to have my own lights sets inside 3ds Max. The idea was a Max Script capable of generating light rays. As long as I remember I never accomplished that and the idea remained in my head since. Then, I don’t know how one day I had this idea of making that “Max Script” software agnostic, so not anymore a plugin within 3dsMax, but a real software that could be used with every software. And finally, in August 2015 I started coding Real IES with the intention of making real the possibility of forging .ies light profiles for rendering usages. It was possible to find many files online, but one had to spend a lot of time to select a profile suitable for a certain rendering. 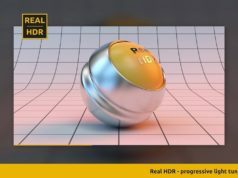 I myself started doing render in 1998 and in the years I created numerous images for customers and the struggle was always the same: find an appropriate photometric file for a certain 3D scene. We all know that precision is important but we also know that these images are mostly made for marketing purposes and not for lighting design (at least these were the requests from my customers). Where I am trying to go is the fact that during that hot August I started coding Real IES with the final feature in mind, but I was not focusing on the user experience and future expansions of the software. Real IES 1 was released, Real IES 2 followed one year later but then I was so constrained on the core of my very first release that I could not push beyond its own technical limits. This is why the new Real IES 3 is a massive update: it has been totally rewritten from the innermost core. Every single method has been analyzed and refactored with the mind in the future: thinking on what can be next to this release. What’s next? In what direction is Real IES going in the future? This latest release absorbed a lot of energy from me so my best guess is that there will be an exchange in the nearby future: 3D/VFX artists will buy and implement Real IES 3 in their pipeline, speeding up and customizing their lighting process creating exactly “that” light they have in mind, while I will have some time for a recreative vacation where I will collect new data to update Real IES with new releases. I will also have time to investigate and develop further my Real HDR and another project I am starting in this period and that I hope will represent a new way to paint textures. 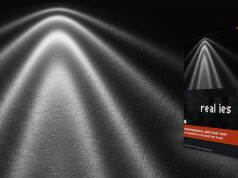 More information about Real IES: on the website and Real IES 3 User Manual.